Now that my thesis is nearly at the end, I can tell you all this secret. I have been so tiddled off at the archaeological paradigm that all ancient horses were wee tiny ponies. Victorian zoologists like Ridgeway and Ewart made up stuff about types, which certainly were not formalised breeds, linking everything they liked, and very much approved of, to the exquisite Arabian horse, and sometimes they made up a whole new species for themselves (like Equus caballus celticus – a totally tiny Celtic pony!) because it seemed like a good idea at the time. However, they were two smart cookies for their time, so I will forgive them, as any horsie person knows, horses get under your skin somewhat, and if we can imagine unicorns, we can imagine special Celtic ponies! However, way out east in the Iron Age, horses were horses, with the ‘fossil’ breed of the Akhal Teke, and the bigger cold bloods, as they call them in equestrian circles. Now, don’t get me wrong – there were indeed very little ponies in the past. 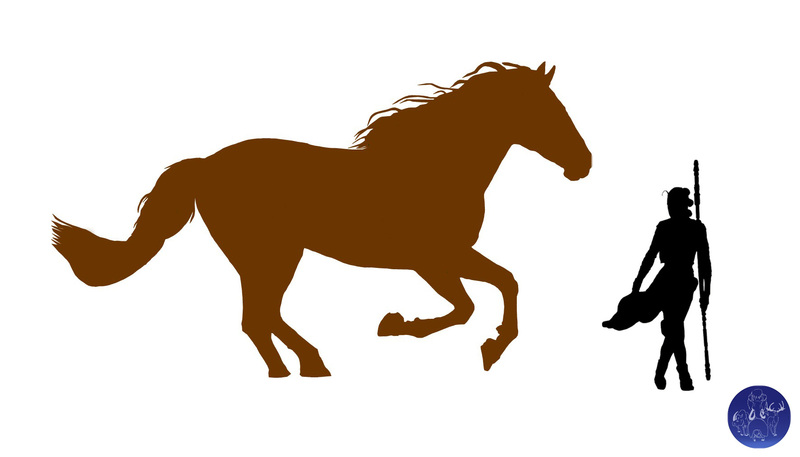 Insular breeds, such as the British Exmoor and Scottish Eriskay, tend to be small, and humans across Europe and Eurasia bred the wildness out of the true wild horse, the Tarpan, making the overall size of equids smaller and narrower and presumably easier to control. The now-extinct Lofoten island pony was likely the ancestor of the real Shetland pony, the ones which haven’t been bred up with new bloodlines chucked in every now and then. The Lofoten was a very small, hairy pony breed, like a pure white teddy bear, which came to a rather instant extinction, when the very last one was shot deliberately in 1897 to preserve its body for science. I know, right? The poor little thing has been on display since then, in Bergen Museum. Nature, however, loves diversity – life forms adapt and grow, or shrink depending on a whole host of environmental factors. If you went back to the Pleistocene, you’d find lots of wild equids of all sizes and all shapes….Equus alaskae, E. nevadanus, E. taeniopus… the list is massive. But among them, there was a giant, possibly bigger than a Clydesdale – Equus giganteus. There are some pretty large gaps of knowledge about E. giganteus, because most of the evidence is based on just teeth. There was supposedly also a full mandible or skull found by ‘Mister Bones’, the 19th century fossil hunter Barnum Brown. The early days of fossil collecting was often met with a flurry of new species. With just a few fragments to go on, later palaeontologists have since noticed that many fossils of ‘new species’ actually all belong to just one species. There’s confusion over whether the fossils of E. pacificus might be a variation of E. giganteus, and there might even be a larger horse, E. enormis, although there is even less evidence for it, being confined to some West Coast USA fossils detailed in Murray’s 2008 thesis. They’ve been primarily found where there were Pleistocene prairies – Texas, Kansas, Oklahoma, California and Nevada. Imagine how stunning it would have been to watch herds of these creatures grazing and galloping. Mind you, with their considerable size, they would need a fair bit of space to gallop wild and free. Now, we measure horses at the withers – the little lump at the base of the neck, not the tops of their heads and we call it hand high, usually abbreviated to hh. E. giganteus likely measured over 20 hands, or 2m (6’7”), as simply, we don’t even know if the few scant remains of teeth we have are from juvenile specimens. (Estimates on total height are 10 feet!) However, we know enough to speculate on E. giganteus to make it a creature of a Tolkeinesque dreamtime, bigger than a Shire Horse, and weighing in between 700 and 1600 kg depending on which reconstruction model you choose to go with (palaeontology is, in this respect, every bit as bad as archaeology- everything has a ‘but what if’ added!). Much good, solid horse sense was written on this by Gidley in 1901, who stated that the superior molar tooth found in Texas in the 19th century was bigger by over a third of the diameter than that of an equivalent modern draft horse. The ginormous size of the North America giant horse, Equus giganteus. While we can pretty much reconstruct the big, dignified head of E. pacificus, another giant Pleistocene horse of the Wild, Wild West, we cannot yet do so for E. giganteus. But we can make some pretty good guesses. So-called ‘primitive’ types and breeds usually have certain distinctive markings, fingerprints from the deep past, carried on shoulders and soft muzzles to remind us of their ancestors, who existed before humans domesticated them. Have a look at the Przewalski horse, with its big solid head, so like cave drawings of Chauvet, or the Dulmen from Germany, or the wee English Exmoor. They have what we call a ‘mealy muzzle’, in that their soft noses are often paler than their coat colouring while their hocks, or lower legs , are darker. Across their withers, running down their backs, is a dark line of hair called a dorsal stripe, although I think of it as a time line, proudly stating the ancient ancestry of the breed. On occasions, with very old breeds, you may even get a hint of stripes on the lower limbs. I’d suspect that Equus giganteus had all of the above, loud and proud. They do say everything is bigger in Texas! Our giant horses were present in the great Pleistocene grasslands of the western USA, but probably took their first leggy steps in the Pliocene, around 2.5 million years ago. Horses are believed to have evolved in the North American continent, moving into South America about 1.5 million years ago. All American species of wild equids became extinct by 10,000 years ago, and the prairies and grasslands were empty of neighs and thundering hooves until the reintroduction of Equus caballus by the Spanish conquistadores of the 1500’s. Some of their horses escaped and reclaimed the land as mustangs, the iconic feral mixed-breed types. But they were, and are, normal-sized horses, unlike the big beauty of E. giganteus. So, what brought the reign of these giant, wild spirits of the grasslands to an end? And when exactly did it happen? The truth is, we really don’t know yet. Regular readers will know that there were huge climate changes occurring during the Pleistocene, which were responsible for some of the megafaunal extinctions. The climate shift resulted in vegetation changes, from higher protein plants ( known as C3 vegetation) to coarser, harder to digest grasses ( known as C4 grasses) resulted in the grasslands being incapable of sustaining many megafaunal species.This is usually considered the reason for extinctions of smaller horses of the Americas, and it may be that E giganteus left the land earlier. After all, there was a whole lot of horse to feed. However, the time we estimate the great horses vanished coincides with the arrival of the Clovis people in North America, probably around 13,000 years ago. Clovis points, the lethally sharp lithics used by these ancient people have been found in Texas although, so it is anyone’s guess as to whether the horses were hunted into extinction. We know humans hunted horses in Europe, so while there is no definite early evidence yet, it wouldn’t be so surprising if a future excavation in the southwest states turns up something more conclusive than ‘maybe’. An indirect possibility is that fires caused by humans could well have destroyed much of the original grasslands. Remember, with large numbers of herbivores on such grasslands, you tend to get predators too, and they will be quite happy to pick off an unwary human as much as any other smaller creature on the prairie.Short-sighted solutions of slash and burn may have hastened the end of our lovely horse. So, we have no idea when Equus giganteus became extinct. Recently, in the name of research, I had the chance to gallop out on a Clydesdale, which is still smaller than E. giganteus. Her name was Niňa, which, meaning little girl, was a bit of a joke. She was huge. I’m an experienced horsewoman, but galloping her felt as if I were strapped to the outer engine of an aircraft taking off, like straddling thunder. While all wild horses are enchanting, triggering something deep inside us as humans, I can’t help thinking of what perhaps dozens or hundreds of horses, well over 20 hh, would be like – storm-clouds made flesh, whinnying and snorting across the grasslands. What I’d give for a TARDIS ( and probably a saddle and bridle) ! Cope, E. D., 1891. ‘On a skull of Equus excelsus Leidy, from the Equus beds of Texas’ American Naturalist. 25. pp 912-913. Cope, E. D., 1885 ‘Pliocene horses of southwestern Texas’ American Naturalist. 19. pp1208-1209. This entry was posted in Horse and tagged Akhal Teke, Celtic pony, Equus alaskae, Equus caballus, Equus caballus celticus, Equus enormis, Equus giganteus, Equus nevadanus, Equus pacificus, Equus taeniopus, Exmoor Pony, Horse, Lofoten Island Pony, Przewalski horse, Sccottish Eriskay, Tarpan. Bookmark the permalink. Clear evidence that humans hunted horses in North America has been found at Wally’s Beach in Alberta, Canada and Bluefish Cave in Yukon Canada. There is also evidence humans hunted horses in South America (from a cave in Argentina). Moreover, a late Pleistocene tool made from a horse leg bone has been found in Florida. It seems likely humans used the bone from a freshly killed horse rather than from an old smelly individual they scavenged. The notion that megafauna became extinct due to changes in C3 and C4 vegetation was debunked a long time ago. Horses thrive on a diet of tough C4 grasses. Grass never became scarce in North or South America during any climatic phase. Therefore, changes in climate could not have been the cause of horse extinction in the Americas. There was a shift in abundance of C3/C4 plants during the late Miocene/Late Pliocene. However, there is no evidence of widespread plant extinctions during the end Pleistocene. If you are going to make the claim that climate change caused or contributed to Pleistocene megafauna extinctions, you should be able to find the associated mass extinctions of plants. Instead, coprolites show the plants megafauna ate are still widespread and abundant today. Therefore, climate change models of extinction make no sense whatsoever. Horses (and most other species of Pleistocene megafauna) were not picky eaters. Horses eat grass–a plant that never became rare in North or South America. Moreover, isotopic studies show that megafaunal grass-eaters could shift to consuming C3 plants in forested environments. If you believe changes in vegetation doomed American horses, you need to explain why they disappeared during this narrow window of time, yet just a few thousand years later when they were introduced by the Spaniards, horses were able to so quickly recolonize much of the continent. I believe the reduced size of horses near the end Pleistocene in Alaska can be explained by human hunting pressure. Smaller individuals reach breeding age earlier than larger individuals. Smaller size was an adaptation to surviving increased human hunting pressure. Well, Mark, it might be a debate for you to take up with the Uni of Alaska’s experts, as much as the plethora of other researchers out there who’ve pretty much proven climate shifts and vegetation changes.If you do have some better evidence that you ‘believe’ we’d love you to share it. Until then, we tend to keep all out options open, but also pay attention to what good, old fashioned slog research on palynology and dental studies tell us! Thanks for your thoughts! The Beast team. Good post, as i like large draft horses, i was quite interested in E.giganteus. Possibly this might be the largest horse that ever existed. Seeing one of these horses alive should be a magnificent sight. I did wanted to make a reconstruction for it. Good post, as i like large draft horses, i was quite interested in E.giganteus. Possibly this might be the largest horse that ever existed. Seeing one of these horses alive should be a magnificent sight. I do want to make a reconstruction for it. Interesting and cool research I just love people immediately attacking it with beliefs and certainties. They remind me of the million old British site erports I had to sift through in college. Obviously this was and Of course this is used to devein shrimp..uh professor it is a land locked country. You fail not get back to digging. Theories are educated guesses and scientific method and inductive logic rule. I wish more people studied that pre-comment on articles like this. Thanks for the share they are thundering in my imagination you can feel the earth move under your feet magnificent. Thank you this was a awesome story.